PEBBLE BEACH, Calif. (AP) This looked like a mismatch to everyone but Ted Potter Jr.
And probably not to Dustin Johnson, either. They started the final round of the AT&T Pebble Beach Pro-Am tied for the lead, and that was the only thing they had in common. Johnson made it through Q-school on his first try after college, won as a rookie and has won every year on the PGA Tour except for 2014. Next week he becomes only the fifth player to be No. 1 in the world for a continuous year. He has 17 victories, including a U.S. Open and a sweep of the World Golf Championships, and he became the fifth player to surpass $50 million in career PGA Tour earnings. Potter turned pro out of high school and worked in a cart barn to help pay the bills and save up for Q-school. He played two-day tournaments to try and earn a few hundred dollars so he could keep going. That’s life on the mini-tours. When he finally made it to the Web.com Tour, he missed the cut in all 24 tournaments he played. In the seven starts before Potter’s first PGA Tour victory, the Greenbrier Classic in 2012, he missed the cut five straight times and didn’t crack the top 50 in the other two. In the nine starts after that victory, he failed to make the cut three times and didn’t crack the top 50 in the other six. He was No. 246 in the world when he stepped onto the first tee Sunday at Pebble Beach. It was hard to tell. Potter, after a three-putt bogey on the opening hole, never dropped a shot the rest of the way. He took the lead when Johnson hit his worst shot of the tournament on the par-3 fifth that sailed over the cliff and led to bogey. Potter chipped in for birdie behind the seventh green. He was never out of a position. There was more to the difficult day, beyond a stiff breeze and firm greens the U.S. Open would love to have next year. After his three-putt bogey to fall out of a tie for the lead, Potter watched Johnson hammer a drive so far down the fairway on the par-5 second hole that he was 48 yards ahead of Potter. Johnson had a 6-iron into the green. They both made birdie. Plus, because of 25 pro-am teams making the cut to play Sunday, the draw can get a little out of whack. Potter and Johnson played with amateur Sean Kell (Potter’s partner). Ahead of them was a foursome – three pros and one amateur. Waiting was inevitable, and they did it on every hole. That’s a lot of time – too much time – to think, especially if you’re a 34-year-old with one PGA Tour victory who had to sit out two full years with a broken ankle that required two surgeries. The first was to insert 12 screws and two plates. The other one was to remove the hardware. Potter never flinched. His mind never wandered. He saw the target. He hit the target. Simple golf that is never quite that simple. He had a two-shot lead that grew to three shots when others made mistakes – Johnson, Phil Mickelson, Jason Day among them – and made them catch him. Johnson closed with a 72 and wasn’t all that bad. He hit two bad shots on No. 4 and No. 5, one that cost him an easy chance at birdie, the other that made him work for a good bogey. The wind fooled him on No. 8 and he went into a back bunker, leading to a bogey. His approach on the 11th was inches away from a short birdie putt, but hung up in the collar and led to bogey. Ultimately, Potter simply outplayed him. Potter won for only the second time in 84 starts – and it was only his fifth top 10. But he had experience winning, no matter the competition. One year on the Hooters Tour, he won three times and earned $180,000. On the mini-tours, that’s enough to feel like a millionaire. He earned $1,332,000 on Sunday. Defending champion Jordan Spieth said before the tournament that the quality of champions can make some victories even more special. In Potter’s case, the final leaderboard can make it even better. 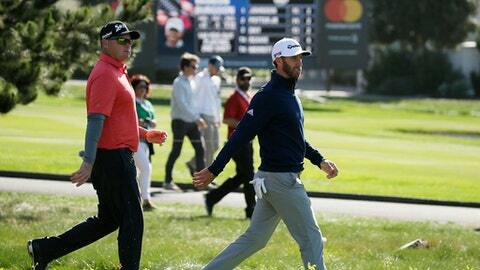 Johnson, Day and Mickelson were among those who tied for second. They have combined for 70 victories on the PGA Tour and six majors. Also in the mix was Chez Reavie, who lost in a playoff the week before in Phoenix. That’s what makes winning so hard. On any given day, the pedigree doesn’t matter. Neither do the credentials. Shots have to be hit. Scores have to be posted.